Sears used to be one of the holiday shopping season's biggest stars. But deep cuts to an already small ad budget puts the once iconic brand in danger of becoming invisible this year. Ads for retailers of all kinds dominate television and the internet during the holiday shopping season. And until very recently Sears and Kmart, which merged in 2005, were two of the biggest voices out there. Now Sears Holdings (SHLD) is in big trouble -- stores are closing and billions of dollars in losses are piling up. So naturally the company has slashed its advertising budget for both its Sears and Kmart stores. But that will make it even harder to attract a dwindling customer base. Sears spent just $67 million on all of its advertising in in the first half of this year, according to figures from Kantar Media -- on television and digital ads as well as print, radio and direct mail. That's down 29% from the same period in 2016. Kmart cut in its ad budget by 41%, to $21 million in the same period. Compare those figures to Walmart (WMT), the nation's largest retailer, which spent $227 million on advertising in the first half of this year. Macy's (M) spent $186 million and Target (TGT) budgeted $164 million. Even JC Penney (JCP), which has plenty of its own problems, spent more than double what Sears did. Sears was the biggest advertiser in the retail sector as recently as 2003, and it held that title going back as far as 1996, when Kantar started keeping records. "Come see the softer side of Sears," was an ad slogan well known by virtually every American. And Kmart was among the top five retail advertisers as recently as 2001. Many of its ads in the late 90's and early 2000's featured Martha Stewart, who had locked in a splashy partnership with the company to peddle her lifestyle brand. Some of its ads were even directed by Spike Lee. Now it isn't even among the top 20 among advertisers in retail. Sears would not comment on Kantar's estimates of its ad spending "for competitive reasons." Analysis of the effectiveness of its marketing caused it to cut back on traditional television and print ads and concentrate more on digital and social channels, according to spokesman Brian Hanover. He pointed out that both brands have started their holiday sales early and brought back its Wish Book catalog. The advertising pullback comes as difficulty mounts at the two chains, prompting Sears Holdings (SHLD) to admit there is "substantial doubt" about its ability to stay in business. Shoppers have turned their backs on both stores. 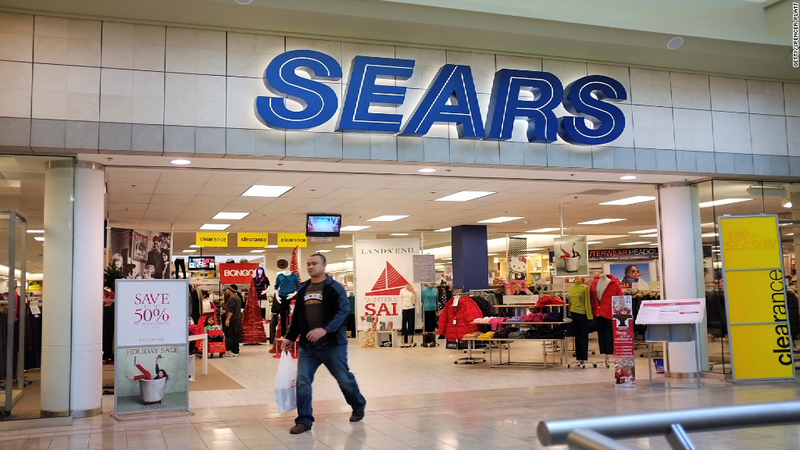 Less than 8% of households visited a Sears in September, the most recent month available, according to figures from Kantar Retail, another arm of the Kantar research firm. Slightly fewer households visited a Kmart. That compares to 63% of households that shopped at Walmart and the same percentage of homes that shopped at Amazon (AMZN). Other retailers trail far behind that figure, but well ahead of Sears and Kmart. For instance, 29% of households shopped at a Target and 18% at went to JC Penney. In fact, more households shopped at Rite-Aid and Office Depot than at Sears or Kmart that month. "Their issue is not just share of households. It's share of mind, share of awareness," said Leon Nicholas, an analyst at Kantar Retail. "It's very, very, very hard to see a way this works."